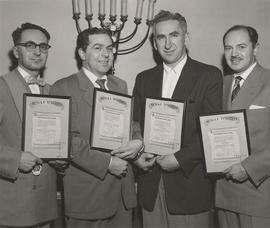 Photograph depicts (l-r) Harold Krivel, Buddy Smith, Myer Goldberg, and Julius Balshine. Photograph depicts four unidentified children being given awards by two unidentified adults. Photograph depicts Bruce Zien presenting an award to Harold Orloff. Photograph depicts a group of children. Some of them are holding trophies. Photograph depicts three women, including Grace McCarthy (right), with a certificate. Photograph depicts a man at a microphone with a table of trophies behind him. Photograph depicts a man standing with seven boys holding trophies.Written on the verso: "2 cols 2 x 5. July 29/82. P. 12 115% 5 150. Centre recognition night June 24/82."